This open letter to the Swedish Migration Office on behalf of Mohammad Mehdi Maleki, an Iranian refugee who has sought asylum in Sweden, was written by Abdollah Asadi, the Secretary of the Solidarity International Federation of Iranian Refugees, on 17 April 2011. We ask everyone to also send a letter to the Swedish Migration Office with the same demands; this letter may be used as a model letter and simply sent to the following email addresses: registrator@foreign.ministry.se and migrationsverket@migrationsverket.se. The letter is reproduced here in English, Swedish, and Farsi. Read the story of the young political activist who protested regularly to stop the stoning execution of Sakineh Ashtiani, among his other political activities against the barbarism of the Islamic Republic, yet who the Swedish government intends to deport to his detention, torture, and probable execution in Iran. Maleki has been a student political activist against the Islamic Republic. Mohammad Mehdi Maleki is among the activists who, using the internet and in various other ways has struggled against the regime in Iran until the moment of his detention. Mohammad Mehdi Maleki, as a result of his political activities in Iran, had been identified and persecuted by the security and judicial authorities of the Islamic Republic, and therefore, on 27 March 2008, sought political asylum from the Swedish government. Unfortunately, his application was rejected on the 3rd of December 2008 by the migration office. Maleki had been imprisoned for some time in Iran, but with the help of family and friends, was released on bail. Using that opportunity, he fled the country, entered Sweden, and asked for asylum. Mohammad Mehdi Maleki, after entering Sweden and asking for asylum in this country, continued his struggle against the medieval rule of the Islamic Republic in Iran. Mohammad Mehdi is among the activists who, in connection to the campaign to save Sakineh Mohammadi Ashtiani from a stoning execution, participated on numerous occasions in demonstrations. During those demonstrations, he protested the savagery of the Islamic regime, and called for overthrowing that regime. Despite this, his asylum application was rejected, and he, like all other refugees, lived in very dire circumstances. The Migration Office gave him permission to work as a trainee in a carwashing facility in Lindesburg. About 2 months ago, the police visited that facility, but Maleki was not there. The owner of the facility called Mehdi and told him about the visit. As soon as he was informed, Mehdi called the police and left his contact information with the police over the phone. The following day, he reported to the police station, but they told him that although they appreciated his responsible diligence in reporting back to them, the police had no business with him. They told him that he may continue working and living as usual. Mehdi has been a law-abiding person during the time that he has lived in Sweden. Mohammad Mehdi Maleki reported to the Lindesburg Police on Tuesday, 29 of March for the last time and signed the usual papers without any incident. But on the 31st of March, only two days later, he was arrested at his apartment and detained. The police told Mehdi Maleki that the reason for the arrest was because he had sought to hide himself from the authorities. Mehdi, in response, told them that if he had been such a fugitive, he would not have reported to the police, left his contact information with the police, and would not have stayed in his apartment [knowing the police had inquired regarding his whereabouts]. He categorically rejected the accusations made by the police. The Federation knows Mohammad Mehdi Maleki very well and knows that he has been involved in political activities against the Islamic Republic in Örebro. The last protest that Mohammad Mehdi participated in took place on March 16 in the city of Örebro, in protest against the massacre of prisoners in Ghezal Hesar prison [in Iran]. Mehdi too, like many others, has left Islam as his religion and has accepted Christianity – he is considered an apostate. During the time that he has been in detention, he has been interviewed by a large number of Farsi-language media inside and outside of Sweden, and has emphasized his political activism and his apostasy. Only these are enough to put him in harm’s way if he is returned by force to Iran. Specifically, the television station called ” Andishe,” in the United States, which broadcasts its programs into Iran, interviewed Mohammad Mehdi Maleki on the 7th of April and aired his story and his photograph. On the 14th of April, the Farsi-speaking radio called Radio HamsafarIran Emrooz in Gotenburg also interviewed him. On April 13th, Radio Voice of Refugees in Gotenburg interviewed Mehdi about his reasons for seeking asylum. In these interviews, Maleki, on numerous occasions, has repeated that he escaped from the Islamic Republic of Iran, but unfortunately, the Migration Office of Sweden rejected his reasons for seeking asylum. Mohammad Mehdi Maleki has played a very active role against the Islamic Republic on Facebook, and has appeared there with his name and picture. Only one of the occasions in which Mohammad Mehdi Maleki participated in a protest against the stoning of Sakineh Mohammadi Ashtiani in the city of Örebro is enough to be indicted by the Islamic Republic for acting against national security and the Islamic Republic system. For instance, the government of Norway deported an Iranian asylum-seeker by the name Rahim Rostami on February 9, 2011, who is now imprisoned in Evin and in harm’s way. Last month, Mohseni Ejaei, the chief of the Islamic Revolutionary Court of Iran, announced during a press conference that the system will treat those outside of Iran who act against the Islamic regime the same way that it treats those citizens inside Iran who act against the regime. Despite all of the above, despite the dangers awaiting Mehdi if he is returned, the migration office has decided to deport Mohammad Mehdi Maleki to the inferno of the Islamic Republic. Considering the consequences and the dangers of refoulement, the International Federation of Iranian Refugees calls on all organizations and institutions defending refugee rights to intervene and demand Mehdi’s release from detention by the Migration Office, cancellation of the deportation, and defense of his asylum rights. Mohammad Mehdi Maleki har varit bland de aktivister som använder Internet och på flera olik sätt har kämpat mot regimen i Iran tills han har blivit arresterad. Maleki, som en följd av hans politiska verksamheter i Iran, hade identifierats och var förföljd av säkerhetstjänsten och rättsliga myndigheter i Iran. Därför den 27 mars 2008, begärde han asyl i Sverige. Tyvärr fick han avslag på sin ansökan den 3 december 2008 av migrationsverket. Maleki satt i fängelse i Iran, men med hjälp av familj och vänner släpptes han fri mot borgen. Genom att använda denna möjlighet, flydde han landet, reste till Sverige och sökte asyl här. Efter ankomsten till Sverige, fortsatte Maleki kampen mot den medeltida styren i den islamiska republiken i Iran. Han är bland de aktivister som i anslutning till kampanjen för att rädda ”Sakineh Mohammadi Ashtiani” från stening, har vid flertal tillfällen deltagit i demonstrationer. Under dessa demonstrationer, har han protesterat mot grymheten av den islamiska regimen och uppmanat till att störta regimen. Trots detta fick han avslag på sin ansökan om asyl och han liksom alla andra flyktingar har levt under mycket svåra omständigheter. Migrationsverket gav honom tillstånd att jobba som praktikant i en biltvätt verkstad i Lindesberg. Ungefär två månader sedan besökte polisen verkstaden, men Maleki var inte där. Ägaren av verkstaden ringde Mehdi Maleki och berättade om polisens besök. Direkt efteråt ringede Maleki till polisen och lämnade ett meddelande till polisen där han berättade för polisen att han bodde på sin gamla adress och jobbade i den verkstaden. Ändå följande dag går han till polisen och polisen berättar även om de uppskattar att Maleki har anmält sig till polisen, men då ville polisen ingenting. Polisen berättade att Malki kunde fortsätta med och arbetet och leva som vanlig. Maleki har varit en laglydig person under sin tid i Sverige. Sista gången Maleki rapporterade till polisen i Lindesberg var den 29 mars och undertecknade det han vanligen skriver under och det hände inget onormalt. Men den 31 mars, bara två dagar senare greps han av polisen i sin lägenhet med anledning att han är på flykt undan polisen och myndigheterna. Mehdi som respons till polisens anklagelser resonerar om att han har aldrig flytt från polisen av den anledningen att han har varit själv i kontakt med polisen och lämnat all sin kontakt information till polisen. Om han skulle fly från polisen skulle han inte stanna i den adress han hade lämnat till polisen. Han skulle inte ens vistas i närområdet. Maleki avvisar kategoriskt polisens anklagelse. IFR känner Maleki väl och vet han har varit delaktig i många aktiviteter mot islamiska regimen i Iran. Sista protestaktionen Maleki deltog i ägde rum i Örebro den 16 mars 2011, som handlade om protest mot massakern på fångar i Ghezel Hesar fängelset i Iran. Maleki liksom många andra har lämnat islam som sin religion och har konverterat till kristendomen, därför han anses vara avfälling. Under den tiden han har varit i förvar hos polisen, har han blivit intervjuad av ett stort antal persisktalande media i och utanför Sverige där Maleki har betonat på sina politiska aktiviteter och sin apostasi. Endast detta är tillräckligt nog att sätta honom i stor fara i fall av återvändning till Iran. Närmare bestämd TV kanalen ”Andishe” i USA som sänder program mot Iran intevjuade Maleki den 7 april och sände hans berättelse och hans foto. Den 14 april den persisktalande radio stationen ”Radio hamsafar Iran Emrooz” i Göteborg har också sänt en intervju med honom. Den 13 april intervjuades Maleki av ”Radio Sedaye Panahjo” i Göteborg och berättade on sina skäl för ansökan om asyl i Sverige. I dessa intervjuer har Maleki gång på gång upprepat att han har flytt från Iran på grund av den kriminella regimen som styr landet, men tyvärr migrationsverket har inte visat någon hänsyn till hans säkerhet och förnekat honom skydd i Sverige. I sin ”face book” sida har Maleki varit aktiv mot regimen i Iran och i ”face book” framträder han med eget riktiga namn och bild. I kampanjen för att rädda ”Sakineh Mohammdi Ashtiani” från stening i staden Örebro har Maleki haft en aktiv roll. Endast en av dessa aktiviteter i Iran kan resultera i att Maleki åtalas för ”agerande mot nationella säkerheten” av islamiska regimen i Iran. Till exempel deporterade Norges regering en iransk asylsökande som hette Rahim Rostami den 9 februari 2011 till Iran, som nu sitter i ”Evin” fängelset och hans liv och hälsa är fara. Förra månaden meddelade Mohsen Ejaei, chef för den islamiska revolutionära domstolen i Iran, under en presskonferens att regimen kommer att behandla dem utanför Iran precis på samma sätt som, regimen behandlar opponenter i Iran. Trots allt ovanstående, trots de faror som väntar på Maleki i fall om han återvänder till Iran eller rättare sagt deporteras till Iran har migrationsverket beslutat att deportera Malkei till helvetet av islamiska regimen Iran. Med anledning av konsekvenserna av en avvisning av Maleki och risken för att utsätta hans liv och hälsa i fara, uppmanar IFR alla organisationer och institutioner som kämpar för meniskorättigheter att ingripa och kräva att Maleki inte ska utvisas utan släppas fri och beviljas asyl i Sverige. محمد مهدی ملکی از جمله فعاليني است که از طريق اينترنت و در اشکال مختلف تا لحظه بازداشتش، بر عليه رژيم ایران فعّاليت ميکرد. محمد مهدی ملکی بدلیل فعاليتهای سیاسی اش در ایران، از سوی مراجع قضائی و امنیتی آن کشور مورد شناسائی و پیگرد قانونی قرار گرفت و به همین دلیل در 27 مارس 2008 از کشور سوئد درخواست پناهندگی سیاسی کرد ولی متاسفانه دلایل در خواست پناهندگی مهدی در تاریخ 3 دسامبر 2008 از سوی این اداره رد شد. ملکی براي مدتی در ایران زنداني بوده و تحت فشار و شکنجه قرار گرفته بود. اما به کوشش خانواده و بستگان خود و به قيد ضمانت از زندان آزاد شد و با استفاده از اين فرصت از کشور خارج و از اداره مهاجرت سوئد درخواست پناهندگی کرد. مهدي ملکي‌، پس از ورود به سوئد و درخواست پناهندگي از اين کشور به مبارزه خود بر عليه قوانین قرون وسطایی جمهوري اسلامي ادامه داد. محمد مهدی از جمله فعالینی است که در ارتباط با کمپين دفاع از حق زندگي‌ سکينه محمدي آشتياني بارها به خيابان آمده و بر عليه وحشيگري رژيم اسلامي و ضرورت سرنگوني آن شعار داده و در تظاهراتهاي متعدد شرکت داشته است. اما با این حال درخواست پناهندگی مهدی از سوی اداره مهاجرت رد شد و پس از آن مثل دیگر پناهندگان در آن شرایط سخت زندگی می کرد و اداره مهاجرت به وی اجازه داده بود که به عنوان پراکتیک در یگ کارگاه شستشوی اتومبیل در شهر Lindesberg کار کند. حدود دو ماه پیش پلیس به آن کارگاه مراجعه می کند ولی ملکی در آن هنگام در آنجا نبوده است. در همین رابطه صاحب کار مهدی به وی زنگ می زند و جریان را به مهدی خبر می دهد. مهدی با دریافت این خبر به پلیس زنگ می زند و روی تلفن پلیس پیام می گذارد و به آنها می گوید من در همان محل سکونتم زندگی و در آن کارگاه نیز کار می کنم. فردای آن روز به پلیس مراجعه می کند و به وی می گویند که کار درستی کردی آمدی ولی ما هیچ کاری در حال حاضر به شما نداریم و مهدی به کار و زندگی خود ادامه می دهد و تا آن زمان تمام مراحل قانونی زندگی در سوئد را رعایت می کرده است. محمد مهدی ملکی آخرین بار که خود را به پلیس Lindesberg معرفی کرده سه شنبه 29 مارس بوده و به پلیس امضاء می دهد و در این روز هم هیچ اتفاقی نمی افتد ولی در 31 ماه مارس درست دو روز بعد او را در منزل خود دستگیر و بازداشت می کنند پلیس دلیل بازداشت مهدی ملکی را فراری بودن وی اعلام کرده است در حالیکه مهدی می گوید اگر من فراری بودم فوری به پلیس مراجعه نمی کردم و برای آنها پیام نمی گذاشتم و حتی در آن منطقه هم ظاهر نمی شدم . بنا براین آنچه که پلیس در مورد مهدی گفته است حقیقت ندارد. فدراسیون محمد مهدی ملکی را به خوبی می شناسد و می داند که مهدی ملکی در بسیاری از فعالیتهای ایرانیان علیه جمهوری اسلامی شرکت فعال داشته است. آخرين تظاهراتي که محمد مهدي در آن شرکت داشت تظاهرات 16 مارس در شهر اربرو در اعتراض به قتل عام زندانيان درزندان قزل حصار بود. مهدی هم مانند بسیاری دیگر از دین اسلام روی برگردانده و به آیین مسیحیت گرویده است. او در طول مدت بازداشت خود در مصاحبه با بسیاری از رسانه های فارسی زبان در داخل و خارج از سوئد به این موضوع اشاره کرده است و همین مسئله می تواند در صورت بازگشت وی به ایران به یک خطر جدی برای وی تبدیل شود. به طور مشخص تلویزیون اندیشه در آمریکا که رو به ایران برنامه بخش می کند در روز هفتم آوریل با محمد مهدی ملکی مصاحبه کرد و گفته ها و تصویر وی را از این تلویزون پخش کرد. در تاریخ 14 اوریل رادیوی فارسی زبان به نام رادیو همسفر در شهر استکهلم در همین مورد با وی مصاحبه کرد. در تاریخ 4 ماه آوریل نیز رادیوی دیگری به نام “ایران امروز” در شهر گوتنبرگ نیز با وی مصاحبه کرد. در تاریخ 13 آوریل رادیو صدای پناهجو در شهر گوتنبرگ باز در مورد دلایل پناهندگی اش با وی مصاحبه کرد. در این مصاحبه ها ملکی بارها گفته است من از دست رژیم جنایتکار اسلامی در ایران فرار کرده ام ولی متاسفانه باز اداره مهاجرت سوئد یکی پس از دیگری دلایل درخواست پناهندگی محمد مهدی ملکی را رد کرده است. محمد مهدی ملکی در شبکه فیسبوک هم نقش فعالی علیه جمهوری اسلامی داشته است در آنجا هم با اسم و تصویر خود فعالیت کرده است. ملکی در کمپین برای آزادی و ممانعت از سنگسار و اعدام سکینه محمدی آشتیانی در شهر “اره برو” نیز نقش فعالی داشت. فقط یک مورد از این فعالیت ها کافی است تا رژیم اسلامی در ایران هر کسی را محکوم به فعالیت علیه نظام و امنیت ملی کند. برای نمونه دولت نروژ در 21 بهمن سال 88 یک پناهجوی ایرانی بنام رحیم رستمی را به ایران دیپورت کرد و هم اکنون در زندان اوین در معرض خطر جانی قرار گرفته است. ماه گذشته نیز محسنی اژه ای رئیس دادسرای انقلاب ایران در یک کنفرانس مطبوعاتی اعلام کرد که با افرادی که در خارج از کشور بر علیه نظام فعالیت می کنند مطابق شهروندان در داخل برخورد قانونی خواهد شد.عليرغم تمام موارد فوق، و خطراتی که در صورت بازگشت به ایران متوجه وی خواهد بود اداره مهاجرت تصمیم دارد محمد مهدی ملکی را به جهنم جمهوری اسلامی بازگرداند. با توجه به عواقب این موضوع و خطراتی که در صورت بازگشت به ایران متوجه مهدی خواهد بود، فدراسیون سراسری پناهندگان ایرانی همه سازمانها و نهادهای مدافع حقوق پناهندگی را به تلاش برای آزادی مهدی از بازداشتگاه اداره مهاجرت و جلوگیری از دیپورت و دفاع از حق پناهندگی وی دعوت می کند. Is economic ties between Swede and Iran more important than the hundreds of human lives daily taken by the Islamic Murderer Regime? Bureaucrats in the Swedish immigration department for sure have enough information about savagery and brutality of the Islamic Regime and how they have imprisoned, tortured and executed tens of thousands of Iranian Freedom Lovers from the first day they took power in Iran in 1979 but still these bureaucrats sending back the Iranian Refugee seekers to be slaughtered by the Cannibalistic Islamist regime. Not only the bureaucrats in the Immigration department are the Islamic Regimes’ collaborators but their bosses, the Swedish government also has join hands with the Islamist Regime by letting their bureaucrats hunt and send back refugees to the slaughter house of Islamic Regime. The Swedish government was for long time was a defender of the universal human rights and liberties but it’s shame that now the same government stands behind the brutal regimes. Vädjar om politisk asyl till Mohammad Mehdi Maleki!! As a Scandinavian person I can’t believe that Sweden, who is delivering Nobel Peace Prices etc., could let this happen!! 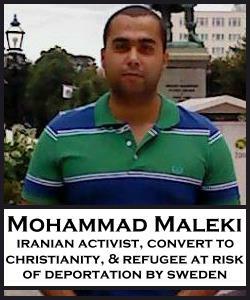 LET Mohammad Mehdi Maleki STAY IN SWEDEN!!! You have my support. My girlfriend Aida Najafi, her sister Avishan Najafi, their mother Manizhe Ghasemi and several other Iranian refugees are in a similar situation right now. You can follow their struggle on http://www.misstroossinte.com.